Hey guys, Here is a guide on “How to install OS X 10.9 on a PC with a Gigabyte 990FXA Series Motherboard and AMD FX Series CPU”. It will also show you how to dual boot windows and OS X and even run the same windows install inside of OS X with VMWare Fusion. Before we start, Here is the exact specification i am using for my Hackintosh install. Ok so although this guide is intended for install on the above hardware it may or may not work on other hardware, It will most likely work on the UD3, UD5 and UD7 motherboards aswell as most modern Radeon HD Graphics. The following items will be required in order for this to work. Access to both Windows and the Niresh Mavericks USB at the same time. You need to take your time and be patient. Both windows and OS X take some time to install. So once you have the Bootable USB/DVD with Niresh on it we are ready to begin. We need to format the HDD with the partition type MBR (for some reason when i did this with windows it didn’t work) to do this will shall boot to the Niresh USB/DVD and at the prompt highlight “Niresh Mavericks” and simply type “amdfx GraphicsEnabler=No PCIRootUID=1 -v” and press “Enter”. If you don’t plan on dual booting you can skip to “Installing OS X 10.9”. OK now the HDD is properly partitioned, We now move on to installing Windows. Once your at the install simply do a “Custom Install” and then install windows to the 1st Partition it will need to be formated to NTFS via the format button below prior to being installed. And now we are on to the main event, Installing OS X. Now you should be back at the OS X install screen, This time we will actually install it, Follow the on screen wizard until you get to the HDD Select page then select the “Mavericks” disk but DO NOT PRESS NEXT/INSTALL instead press “Customize” and uncheck the option “GraphicsEnabler” located under the “Graphics” section. Now you can begin the install. Press the install button and prepare to wait a while depending on your SSD/HDD. Ok now we have OS X and Windows installed but most likely booting OS X from the HDD won’t work and instead you will need to use the USB/DVD. So once again boot to the Niresh USB/DVD but then at the prompt highlight “Mavericks” instead of “Niresh Mavericks” enter ‘ “Kernel Cache”=amd GraphicsEnabler=No PCIRootUID=1 -v ‘ note the quotes need to be entered around the words “Kernel Cache”. After a little while it should boot to OS X and ask you to enter various information for the welcome screen, After you have entered this you should be at either the “Login Screen” or the “Desktop”. If your using the exact same card as mine you most likely are not running at native resolution and are instead forced to 1024×768, To fix this we need to modify 2 kext files, if your running at native resolution skip the step below. Load up a Terminal (Search > Terminal) and then type “sudo su” and enter admin password, Now type “nano /System/Library/Extensions/AMD7000Controller.kext/Contents/Info.plist” and then find “68181002” and change it to your device and vendor ID (mine is 68191002) once done press “Ctrl or Win + X” and then repeat the same change for “/System/Library/Extensions/AMDRadeonX4000.kext/Contents/Info.plist”. Now the graphics is sorted provided your using a similar card to mine atleast, Now we can sort out issues with the bootloader on the HDD, Download “Chameleon Wizard” then run it and select “Boot0HFS” as the install mode and then press “Install”. Now reboot and you should be able to boot from the HDD and select the “Mavericks” option, you may need to enter “GraphicsEnabler=No” and “-v” is useful to see more detailed/verbose information. Congratulations you are done sorting out OS X, The steps below are optional but highly recommended. So you successfully got OS X working on your system, Now we should update OS X to the latest version (10.9.1 as of the time i was writing this) and the AMD Kernel to a newer and faster version. Download the following file http://www.osx86.net/files/download/3736…4-support/ and extract it. Next select “Go” on the menu bar, and then “Go to folder” and then “/”, This will put you to the root of the OS X Partition, Now we need to replace the mach_kernel with the download mach_kernel file. Simply copy and paste and confirm the authentication. Now we need to copy the downloaded “System.kext” to “/System/Library/Extensions/”, once this is done you will most likely get some errors don’t panic!. Now we load “Kext Wizard” (installed with niresh) and select “Repair” and “Rebuild” under the “/System/Library/Extensions/”. Once “Kext Wizard” is done, Click the “Apple icon” in the “Menu Bar” and select “Software Update” and “Update All”, This will take a little while, When asked to reboot say yes. Now your system should reboot and you should be back at OS X at 10.9.1 instead of 10.9.0. 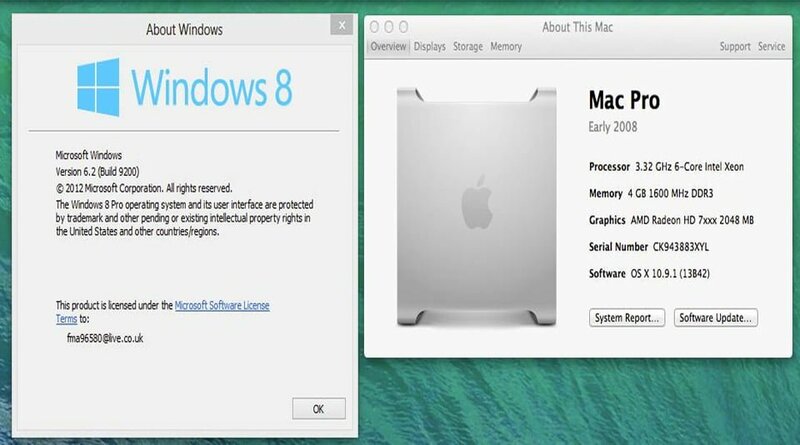 Ok so, So far we have Windows and OS X installed to the same HDD on your PC, Now we will use the physical install of Windows inside of VMWare Fusion this will allow us to use Windows both inside of OS X and as a actual boot option. Of Course this requires VMWare Fusion and this is a commercial piece of software therefore you will need to acquire VMWare Fusion prior to continuing. Ok so now that you have acquired VMWare Fusion and installed it we can continue on to setting up the “boot camp” partition. Firstly we need to make sure that the windows partition is set to be the active partition, to do this we can load “Terminal” > “sudo su” > “fdisk -e /dev/rdisk0” > “f 1” > “write” > “y” > “exit”. Ok now it should have set the windows partition as the active partition, Now load up “VMWare Fusion” and select “More Options” and then “Install from bootcamp” and then “Create bootcamp virtual machine”. Now the VM should be created and you should be able to simply start the VM and Windows 7, 8 or 8.1 should start and start the vmware tools install procedure. Now exit the VM and VMWare. Now we need to restore the active partition back to OS X by doing the following load “Terminal” > “sudo su” > “fdisk -e /dev/rdisk0” > “f 2” > “write” > “y” > “exit”. And now we are done! click the “unity” button in VMWare to integrate it even more. We now have VMWare with Windows + Windows as Dual Boot with OS X. Thanks to Niresh and everyone else involved! the HDD that I’ve totally cleaned for the installation doesn’t show up in disk utilities. it’s function “format disk for Mac” but that didn’t help either.